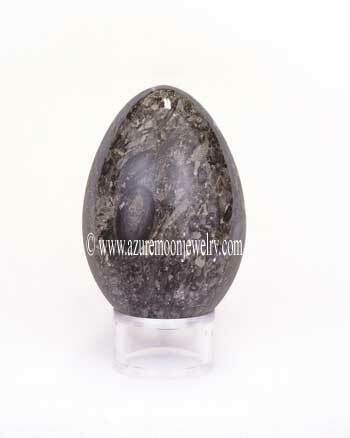 This large, stunning and extremely collectible Nummulite Oceanic Fossil Stone Egg was mined, sculpted and richly polished by hand to a high gloss finish in Pakistan � the home of the highest quality and most beautiful Nummulite Oceanic Fossil Stone in the world. Also known as Nummulite Fossil Stone, Oceanic Fossil Stone, or simply Fossil Stone, it is highly sought after by both beginning and serious gemstone egg collectors and home decorators alike. This exotic Nummulite Oceanic Fossil Stone Egg is an excellent example of these 65.5 million year old sea creatures and how they have been frozen in the sands of time deep within Mother Earth. The beautiful crystalline structure of this egg is comprised of dark putty grey Limestone that is loaded with dozens of both large and small fossilized, pre-historic Nummulites and other charcoal, dark grey and slate colored sea creatures that swam the shallow waters of the Tethys Ocean 65.5 million years ago. One can very easily get lost looking into this egg and discovering all of the pre-historic sea creatures contained within. This fascinating Nummulite Oceanic Fossil Stone Egg is truly one of a kind and it is an absolute must have for any fossil, or gemstone egg collector! 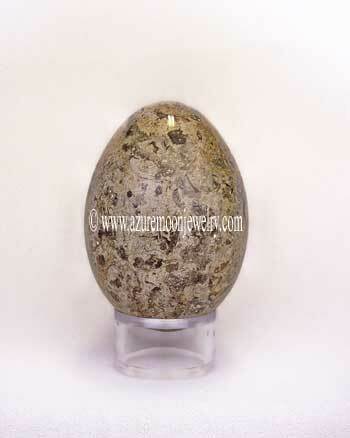 This Nummulite Oceanic Fossil Stone Egg is the size of a duck's egg and measures approximately 3� L - 2� W and weighs 264 grams or 1320 carats. The crystal clear acrylic display stand is included.